Much like a wagon master himself, actor Ben Johnson sets the pace of Wagon Master (1950). He confidently nudges the movie along, knowing it’s headed in the general right direction and content to let it take its unhurried time getting there. There isn’t much talk. Scenes develop naturally. The mood is amply generous, good humored, and polite. When Travis Blue (Ben Johnson) rescues a man who falls from his horse during a stampede, the man responds, “Thank you kindly, brother.” Travis replies: “You’re welcome.” It’s a rare movie that minds its manners even in the midst of a major action scene! 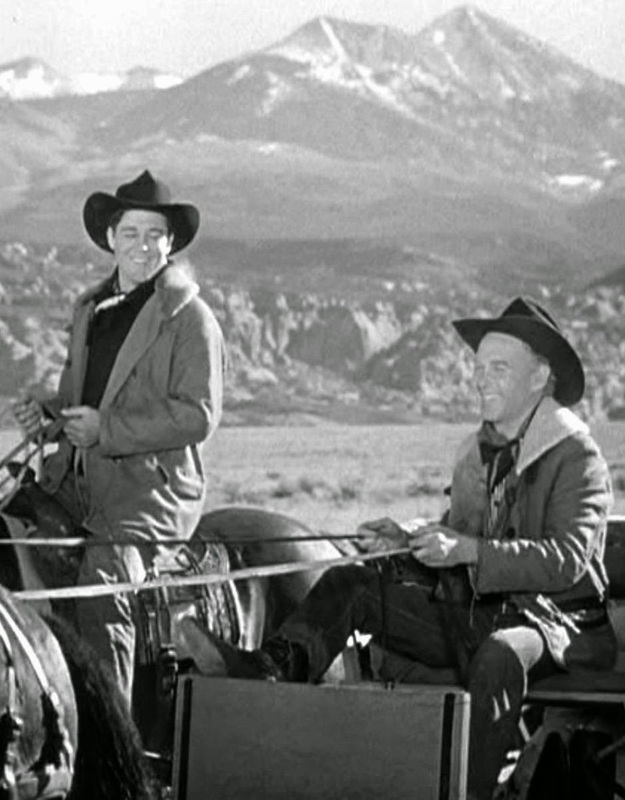 Johnson was 31 when Wagon Master was filmed in the fall of 1949. He had successfully handled only one leading role and that was in Mighty Joe Young (1949), where he was really a supporting actor to a stop-motion animated gorilla named Joe. 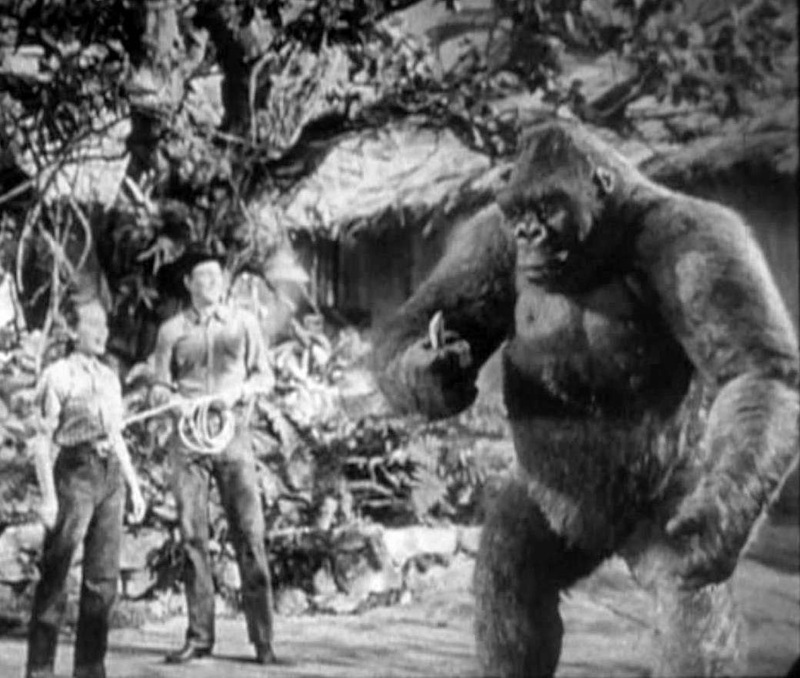 But to the extent that Mighty Joe Young is a reworking of King Kong (1933), Johnson’s romantic lead is the only element in the film that really improves upon Kong. While Bruce Cabot brought some believability to his comparable sailor role in Kong, he was a little out of his depth in the love scenes. 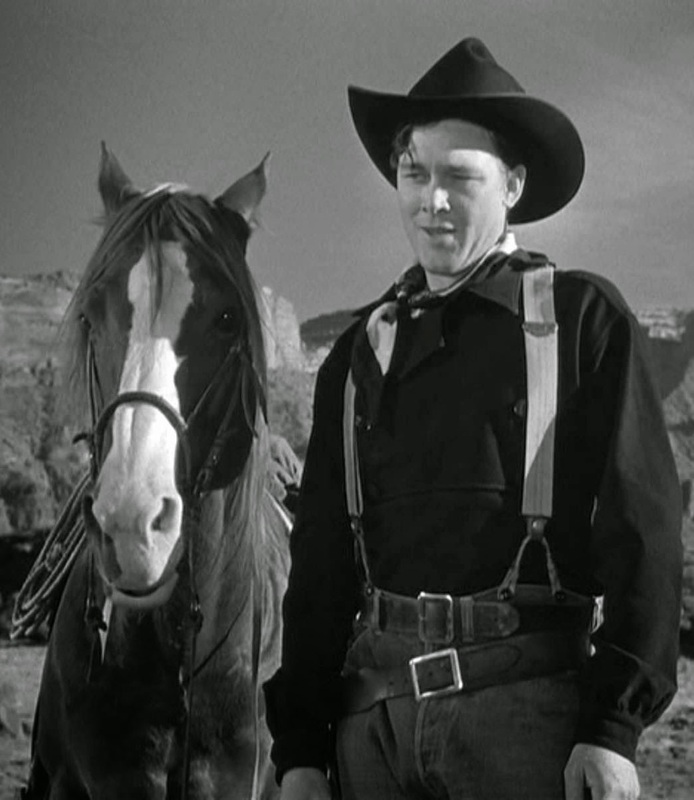 In Mighty Joe Young, Johnson projects confidence whether on his horse, interacting with Joe, or playing the love scenes. in Mighty Joe Young (1949). To some degree, Johnson’s role in Mighty Joe Young wasn’t much of a stretch. He essentially plays himself—a professional horseman and rodeo enthusiast flirting with show business. He had arrived in Hollywood in 1940 at the age of 21, first working with Howard Hughes on The Outlaw and then gaining experience as a freelance stuntman. His riding expertise was his calling card. Westerns were popular and he made good money. John Ford signed him to a contract with his own production company Argosy Pictures in 1947. 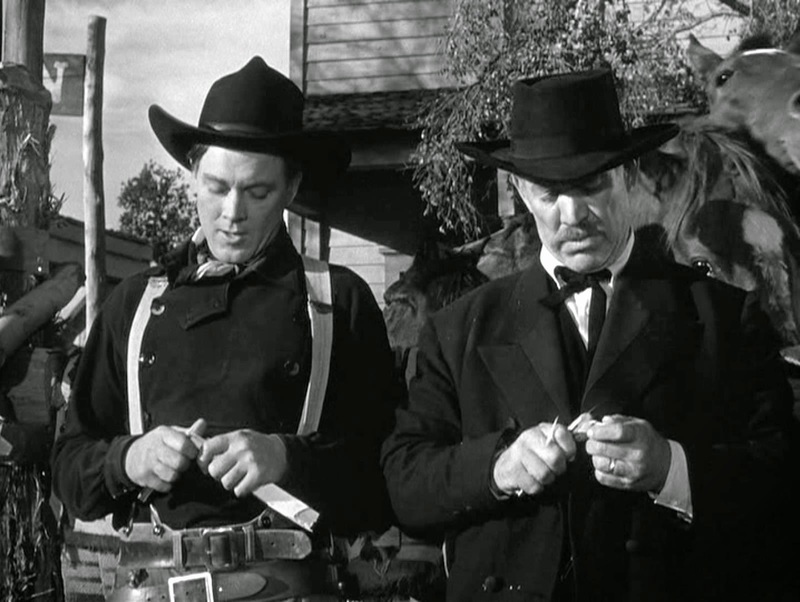 For Argosy, Johnson starred in Mighty Joe Young (directed by Ernest Schoedsack) and then played a memorable supporting role in John Ford’s She Wore a Yellow Ribbon (1949). Wagon Master came next. He was a player on the cusp of stardom, untutored in the fine points of acting but possessing a natural talent. 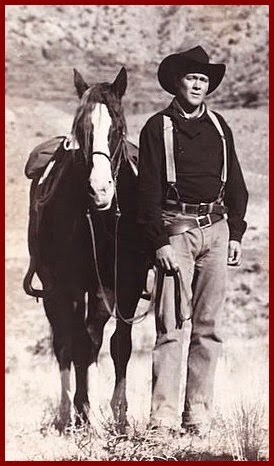 John Wayne had gone far with comparable gifts as had many others. 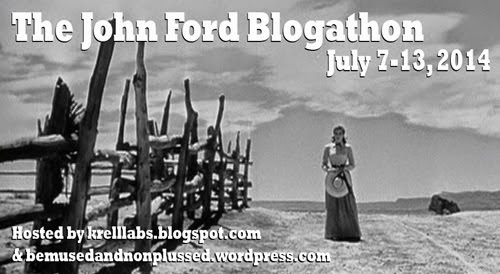 Working together, John Ford and Ben Johnson kept it real, with Ford allowing Johnson’s low-key authenticity to resonate on the screen. Many stars didn’t like the way Ford mercilessly cut dialogue, but Johnson didn’t mind. Most stars didn’t do their own stunts, but out on location on the high deserts of Utah, Ford relied upon Johnson to do all his own stunts. As Ford knew, the viewer can see the difference. No other stuntman could ride a horse like Ben Johnson. Ultimately, Johnson’s thoughtful performance is the single strongest element in Wagon Master, one of Ford’s greatest movies. It would have been nice if it had catapulted Johnson into full-fledged stardom. But when Wagon Master failed to register at the box office, Johnson took it in stride, slowly building a career as one of the most respected supporting actors in the business. Johnson was fine with the way things turned out. He never liked handling all that dialogue anyway. He’d rather be out riding. 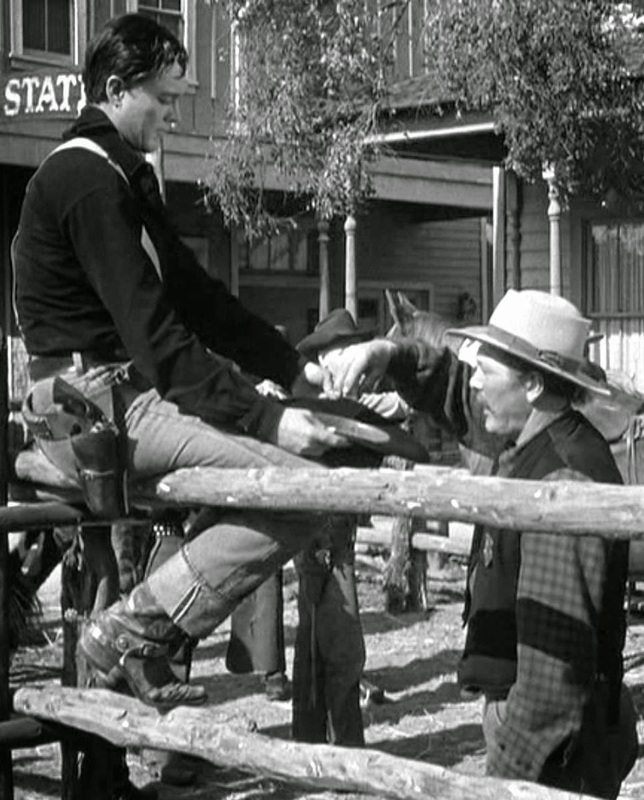 in this scene from Wagon Master (1950). Sandy can count on $160, and Travis will get $200. This is fine with Sandy, and he seems happy to have someone else doing the hard work of math for him. 2. Business in Town: Arriving in town, Travis sells a horse to the marshal for $10. We can assume this is largely for political reasons. The figure is significantly less than the $30 per head that Travis had anticipated but it keeps them in town and in business. 11 remaining horses x $50 = $550. Travis and Sandy are back in business. But Elder Wiggs is only interested in purchasing the horses if the two agree to sign on to their wagon train to lead them to their new home. He offers an additional $100 for wagon master duty. Travis is non-committal. 3. Goal Achieved: A scene later when Travis belatedly accepts Elder Wiggs’ offer, he asks for $450 silver dollars due when they reach the San Juan River Valley. Elder Wiggs shakes his hand and it’s a deal. The business deal, sealed with a handshake. If we assume that Travis and Sandy are still getting $100 for leading the wagon train, that leaves $350 for the horses. Count in the $10 paid by the marshal, and you’ll see that Travis estimated correctly in the beginning: They’ll be getting $360 for the horses. Elder Wiggs thinks he got the best of the deal and Travis got what he thought was a fair deal for the horses all along. That’s how friendly business is conducted in the old west of Wagon Master. 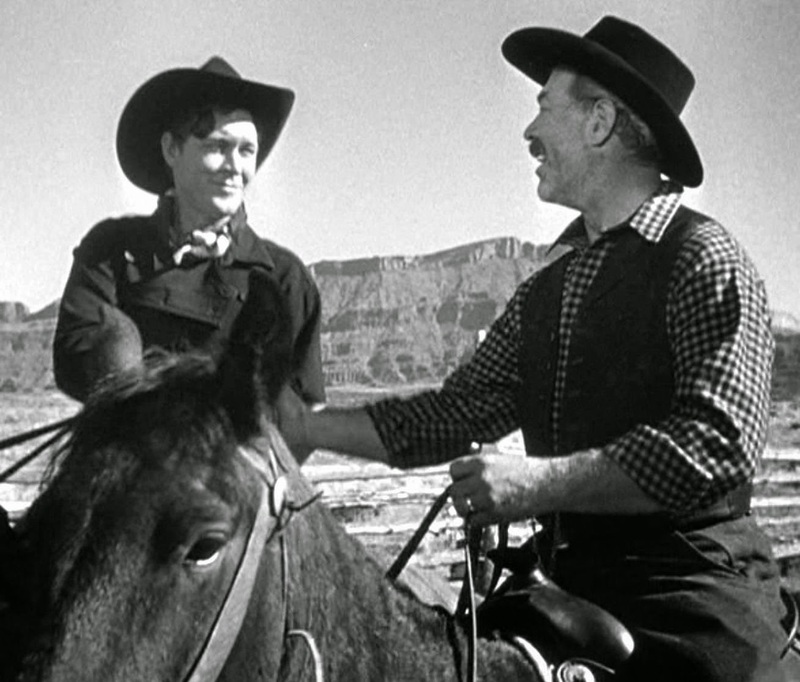 For the Wagon Master premieres, Ben Johnson, Harry Carey, Jr., and songwriter Stan Jones traveled to targeted cities. 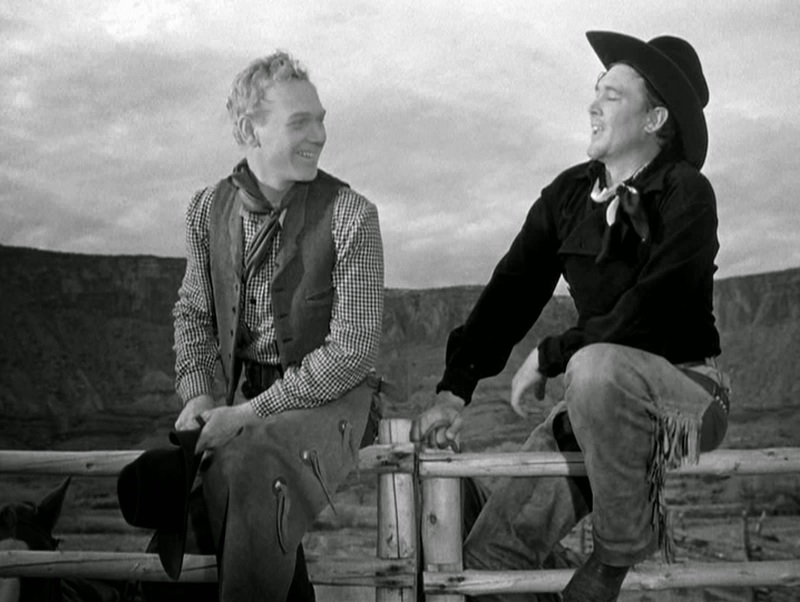 According to The Nicest Fella by Richard D. Jensen, the trio appeared at the Oklahoma premiere of Wagon Master on August 20, 1950 and performed a sing-along before the movie. I assume they sang “Song of the Wagon Master,” as it’s the song that Travis and Sandy briefly sing together in the movie (and reprise just seconds before the final credits, joined by Ward Bond). For my gal I’ll still be yearning. Special thanks to Paula Vitaris who manages the Ben Johnson Fan Page for generously sharing screen captures and providing valuable background information and insight! Company of Heroes: My Life as an Actor in the John Ford Stock Company by Harry Carey Jr.
Purchase the Wagon Master DVD at Amazon or Barnes & Noble. Rent Wagon Master at Netflix or other rental service.